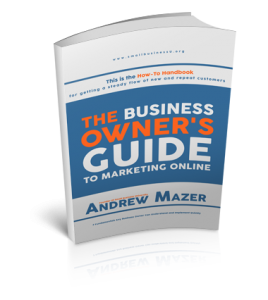 Thank you for your interest in THE BUSINESS OWNER’S GUIDE TO MARKETING ONLINE free download. It’s only 40 pages but it’s packed with information you can understand and use. VIEW OR DOWNLOAD THE BOOK NOW. CLICK HERE. You can also choose a full-printed copy of the book is only $7.00 and includes FREE DELIVERY. We recommend you buy one to keep by your desk for quick reference. Order yours today. CLICK HERE.